5 Oct 2018 – Rohingya campaigners and human rights organizations welcomed the UN Human Rights Council’s vote on Sept. 27 to set up a body to conduct a further investigation and future indictment of Myanmar for atrocity crimes, including genocide. The resolution, co-sponsored by the Organization of Islamic Cooperation (OIC) and the European Union, was passed by a vote of 35-3 with seven abstentions, with only China, the Philippines and Burundi opposing it. The current calls for justice and accountability for the victims of the Myanmar genocide — ongoing still — must go beyond conceiving justice in a narrow technical judicial sense and consider the tangible and pressing need of the Rohingya, including the sitting duck Rohingya inside Myanmar, those in camps in Bangladesh and those on the verge of deportation in India. While the International Criminal Court and/or other ad hoc international tribunals in the style of the tribunals on Yugoslavia and Rwanda would be a welcome step in the right direction, none of the international judicial processes will likely alter the genocidal conditions in which Rohingya have been forced to exist for several decades. Here is a very grim picture: A Harvard Medical School study published in the Lancet (2016) found the doctor-patient ratio for Rohingya in the two predominantly Rohingya towns of Buthidaung and Maungdaw is 1:180,000 while the national average is 1:1,000. According to the World Food Program survey of July 2017 — which was shelved a week after its release under pressure from the Aung San Suu Kyi government — of 80,000 Rohingya children under the age of 5 surveyed in a select Rohingya region of Western Myanmar, severe malnutrition and acute severe malnutrition or semi-famine like characteristics are prevalent. A Physicians for Human Rights study in October 2016 uncovered the severe deprivation of access to even rudimentary health services: a Rohingya person is made to go through, on average, three to four security checkpoints from home to the nearest village clinic, typically without a doctor or emergency medical care. Genocide against the Rohingya is more than a series of acts of genocide, but it is still an ongoing process, and its instigators remain with impunity at the highest levels of authority in Myanmar. As the 440-page Independent International Fact-Finding Mission report (Sept. 18) noted, the structures, institutions and policies designed to destroy the Rohingya community from its very foundations remain in place. These conditions and the decades-old policies that have induced them remain in place. The World Court or other judicial processes, domestically or globally, are not going to alter them. And there is something that is even harder to change that serves as the obstacle to ending Myanmar’s ongoing genocide: the utter impotence and non-functioning of the UN Security Council when it comes to large-scale, policy-induced human suffering, from Yemen and Syria to Palestine and Uighur East Turkestan, or Xinjiang, in China. The veto-wielders — not just the usual illiberal suspects such as Russia and China but also the U.S. and UK — have proven incapable of upholding the UN Charter. Outrageously, one year after the now-well-documented genocidal acts committed by Myanmar, the Security Council has not been able to reach a consensus about what to call the crime, objectively, let alone ending it decisively. In light of this realpolitik, the UN system, particularly the Security Council, is the last place where the Rohingya will find any meaningful support for either realizing their long-term needs for justice and closure (such as criminal prosecution of the perpetrators of genocide) or the immediate need for safety and protection of the remaining Rohingya populations inside Myanmar and in the refugee camps in Bangladesh. The UN officials and ostensibly pro-human rights members have been urging the creation of “safe conditions” so that 1 million Rohingya in Bangladesh who fled Myanmar’s periodic waves of genocidal terror could return and rebuild their communities. Bangladesh’s Prime Minister, Sheik Hasina, has consistently called for safety — and even “a safe zone” or international protection, “if necessary” — for the Rohingya population inside Myanmar. She has made this sensible call at the UN General Assembly for the past two years since the genocidal killings hit world news headlines in August 2017. No one has heeded these essential calls while promising to throw more aid money at the symptom, namely “the Rohingya humanitarian crisis”. Meanwhile, echoing U.S. President Donald Trump, Aung San Suu Kyi’s man of the hour at the UN, Minister Kyaw Tint Swe of the Myanmar State Counsellor’s Office, rejected the World Court’s jurisdiction and dismissed the Independent International Fact-Finding Mission on Myanmar and its 440-page genocide report as having “no hard evidence”. The Burmese rejection of evidence is beyond belief in the face of the satellite images of nearly 400 destroyed Rohingya villages, consistently accurate and credible oral testimonies of thousands of genocide survivors and numerous legal and academic studies as well as journalistic investigations that reach a single conclusion: it is genocide, no less, that Myanmar is committing. So what then needs to be done? 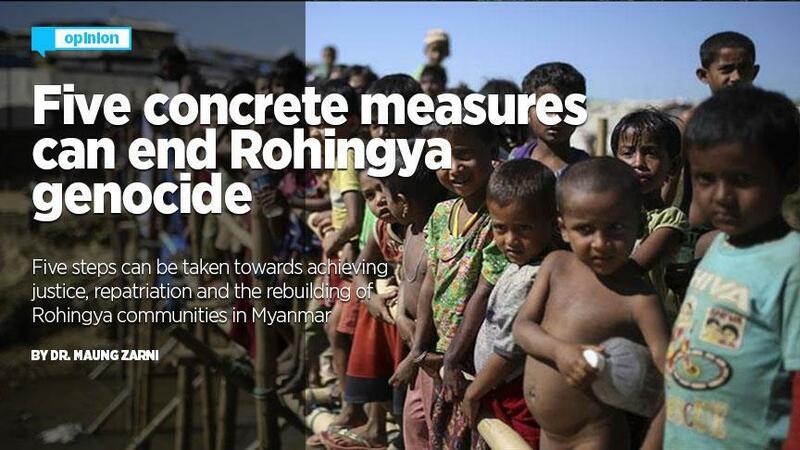 There are five concrete steps that can be undertaken with the view towards justice, repatriation and rebuilding of Rohingya communities inside Myanmar. First, there is emerging a network of state actors — governments, that is, — which can establish something along the lines of “an international coalition of governments for ending Myanmar’s genocide”. Conceivably, Canada, Sweden, Ireland, Bangladesh, the Netherlands, the UK, certain Rohingya-concerned OIC member states (such as Bangladesh, Malaysia, Indonesia, Turkey, Kuwait etc.) and those from Latin and Central America with experience in atrocity crimes at home can form the core of this coalition. This coalition can, in a more focused manner, explore concrete ways, with the requisite condition of safety, to facilitate Rohingya’s return and the rebuilding of their lives once they are in their places of origin inside Western Myanmar adjacent to Bangladesh’s borders. The word “international protection” conjures up images of UN peacekeepers. But the Blue Helmets have an extremely poor track record: consider the Dutch peacekeepers in Srebrenica whom the ICC ruled to be complicit in the genocide or Canadian troops shooting dogs that came to eat the corpses of Rwandan genocide victims because UN peacekeepers in the capital, Kigali, were ordered to stand down as the genocidal slaughter raged on. For instance, the coalition can push for the idea of attaching significant numbers of civilian human rights monitors and experienced military veterans to UN agencies based in Myanmar, as well as to the humanitarian organizations such as the International Committee of the Red Cross or Medicine San Frontiers. They would need to be based in Rakhine State in Western Myanmar, where these atrocity crimes occurred. The presence of these civilian human rights monitors ought to be made a non-negotiable condition for any interactions and agreements between Myanmar and the coalition’s partners as well as the UN agencies. The job of providing for the returning Rohingya or those who remain inside Myanmar cannot be left in the exclusive hands of UN agencies. Besides being toothless even to secure their own unhindered access to the crime sites of Rakhine from where 725,000 fled in a span of a few months, the “UN as a whole” has been called out by the Independent Fact-Finding Mission on Myanmar for its categorical failures to implement the organization’s “Rights First” policies adopted in the wake of Sri Lanka’s war crimes in 2008. Second, the coalition needs to start inter-state conversation about de-militarization of northern Rakhine state, where the persecution has been institutionalized by Myanmar’s military for several decades. Concretely, there needs to be established a de-militarized zone where Myanmar will be forced to engage in community policing designed to minimize and prevent petty criminality in the communities within its border region of Western Myanmar. In this respect, UN member states — 35 in total — who voted in favor of the UN Human Rights Council resolution last week to establish an international body tasked with collecting evidence for a future international tribunal on Myanmar may likely join this international coalition. Third, as part of the neighboring state, Bangladeshi troops across the border need to step up their security functions to ease Myanmar’s (un-warranted) fear of Islamist “penetration” into the Rohingya communities. That should not be a problem for Dhaka, which has come under heavy international criticism for its heavy-handed if effective handling of radicalization and violence among Bangladeshi communities. Fourth, individual nations that are prepared to be a part of this coalition can take unilateral actions designed to signal to Myanmar — and the world — that genocide is the red line that no fellow UN member will be allowed to cross. As a matter of fact, Canada took an exemplary action when its parliament unanimously declared Myanmar a genocidal state while its executive stripped, in an unprecedented move, Aung San Suu Kyi of Canada’s highest honor — honorary Canadian citizenship. More concretely, other nations in the coalition can review their ties — commercial, military, intelligence, educational, etc. — with the view towards using them as leverage or simply suspending them as a signal of condemnation of Myanmar’s heinous Rohingya policies. These nations of conscience need to, at the bare minimum, suspend, downgrade or outright cut diplomatic relations if Myanmar doesn’t change its genocidal course. Specifically, the coalition members need to send Myanmar ambassadors, counsel generals and military attaches packing. These measures have been proven effective in the past: when worldwide ostracism of South Africa and its apartheid regime took place, the racists in power were eventually forced to dismantle their savage political system. Worldwide, governments and societal actors (universities, football clubs, theatrical groups, etc.) ought to be persuaded to shun Myanmar in various aspects of its foreign interactions and revive the “Pinochet Precedent”. Australia’s lawyers and rights campaigners are using the Commonwealth Law to hold Myanmar State Counsellor Aung San Suu Kyi accountable for her vital role in Myanmar’s crimes against humanity regarding Rohingya people. Fifth and finally, on the economic front, the governments within the coalition should advise their national investors to either divest from the Myanmar market or not to invest in the country. To be sure, a commercial boycott of Myanmar may not bring about the needed behavioral change on the part of the country’s leaders if only because investments from Myanmar’s neighbors such as China, Singapore, South Korea and Japan make up the country’s largest foreign direct investment. But Western and Middle Eastern investors and markets still have sufficient global influence that the medium and long-term impact of such collective action by the coalition partners will affect foreign economic actors from the genocide-bystanding or collaborating states such as India, Japan, Singapore, South Korea and China. China may be too big and too thick-skinned for, say, the reputational damage incurred from such a critical stance and boycotts from the coalition. Already being in a trade war with the United States (and its Western allies), and under close watch from human rights campaigners for its Uighur “re-education camps”, Beijing may be more vulnerable to global negative opinion that is assumed. But less important actors such as Singapore or South Korea will certainly be forced to review their ‘business-as-usual’ ties with Myanmar. And the EU and Organization of the Islamic Cooperation, which co-sponsored a human rights resolution on Myanmar on the grounds of a fact-finding mission’s genocidal allegations, will need to reconsider their contradictory behavior on Myanmar: 300+ EU investors and some of the leading investors from the OIC remain very active in Myanmar. Neither bloc can slam Myanmar for committing the gravest of crimes while their money is propping up the genocidal perpetrators in Naypyidaw. There are 200 UN member states, and about 140 of them are signers of the Genocide Convention. That is a lot to work with to effect positive change for the Rohingya, and for Myanmar’s violent and regressive politics. Since the closure of the last Nazi death camp in August 1945, one hears of “Never again!” ritualistically. It’s the 11th hour of Myanmar’s genocide. Nations of conscience must band together, punish Myanmar’s perpetrating regime and provide effective protection to the genocide victims.